Consumers in their wants and needs still drive progress, and when the immediate dangers from the risks to normal living introduced by statist interventions recede, the fact is that life goes on. With sound money and free markets, the evolving production of businesses increases the purchasing power of money over time. We learn, out of the blue, that “the Eurozone is performing well, but with opinions divided on the causes, doubts linger over whether it is a sustainable recovery” (Daily Telegraph, 19 April). We are also told that economic growth in the US is stalling, as evidenced by downward revisions by the Atlanta Fed, and the fact that the rate of increase in Loans and Leases by commercial banks is also stalling. The Bank of England was unable to forecast the strength of the UK economy in the wake of Brexit. This article explains why this confusion occurs. It is clear the economics profession is ill-informed about the one thing it is paid to know about, and the commentary that trickles down to the ordinary person is accordingly incorrect. State-educated and paid-for economists always assume the private sector is the problem, when it is the burden of the state, and the state’s futile attempts to manage the consequences of its actions through the corruption of money. By misdirecting their attention to the private sector in the search for solutions, economists confuse growth in gross domestic product with progress. Growth is the expansion of a balance sheet total, reflecting an increase in the amount of money spent in the economy between two dates. Progress, on the other hand, is the improvement in living standards we get from more efficient production and technology. Take Italy as an example. The chart below is of quarterly real GDP. Bear in mind the annualised rate is four times the quarterly figure. GDP is today’s standard measure of economic performance, and it shows that the volume of consumer transactions in Italy today is well below the record achieved in 2008, before the financial crisis. That’s still down over 7% after eight years. It is a disaster for those out of work, the unfortunates who are not earning to spend. It’s bad news for government, which relies on taxes from income and VAT. It’s socially divisive. But for most Italians, unless they are paying appreciably higher taxes, life has improved. They are still eating the same things mostly, going out to restaurants occasionally. For the last four years, Italian domestic car sales have increased from 1.3 million to 1.8 million. Cars are more reliable, safer and better today than ever before. Improved computers, flat screen TVs and electrical white goods whose prices have fallen have also seen good demand at lower prices, improving people’s standards of living, ease and enjoyment. 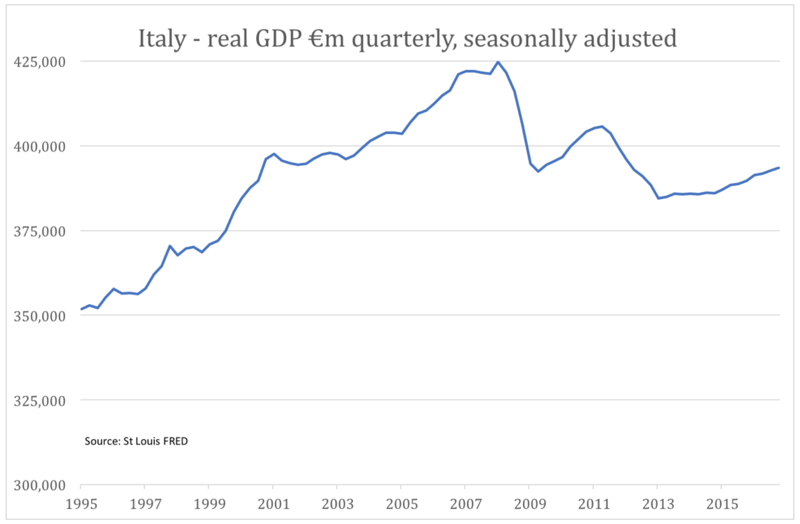 The one thing that the fall in Italy’s GDP has failed to capture is this progress. The same is true in France, except the anti-progressive element in the economy, government, is larger as a proportion of GDP. State-provided services are generally slow to progress, and many are stuck firmly in the past. The state also destroys wealth through taxation. In France, profit has become a dirty word, replaced by puritanical socialism. But notwithstanding all this, the French are also buying better cars and flat-screen TVs. Despite every obstacle government places in their way, it just cannot stop people from progressing with their lives. The same is true in America. Growth in loans and leases can slow, the Atlanta Fed prognosticate, and still the economy progresses. And how did anyone really think that after Brexit, people and businesses would suddenly stop buying the goods and services they desired, and stop working? The Remainers complained at the idiocy of Brexit, but didn’t change their spending habits one bit. If anything, the removal of uncertainty led to a surge of capital investment, which had been only held up by the referendum. Life returned to normal. This is so obvious, it is amazing that very few modern economists see it. The reason is quite simple: the whole of the neo-Keynesian macroeconomic profession has rejected the one economic truism that stands in the way of their belief in intervention by the state, and that is Say’s law. Say’s law is very simple. It states that in a world where we divide our labour, we produce to consume. It therefore follows that if we are not able to produce so that we can consume, someone else must produce on our behalf. The disabled, the unemployed, the home-makers and children have their consumption paid for by someone else, a partner in marriage, family member, or parent. Welfare distributed by the state doesn’t change this iron law, because the state must tax someone else’s production or debase their earnings to cover welfare distribution. This cannot be denied. We are all at the same time producers, consumers and savers. These functions can no more be separated than the human body be divided into three parts and still function. The role of money is to facilitate the exchange of production for consumption in both its forms, no more than that. Attempts to manipulate the quantity of money do not change this underlying truth, beyond being disruptive. Therefore, reflationism never succeeds. It is also the reason why economists who believe in state reflation in defiance of Say’s law get it horribly wrong every time. There are many implications for macroeconomists, who having made this wrong turn, have built their theories on sand subsequently. The first is to understand the shortcomings of economic measurement. GDP, GNP and similar statistical inventions, whether or not adjusted by price inflation, can only record total transactions in monetary terms between two dates. For example, in the chart above, we can say that in the third quarter of 2016, the money spent on total recorded transactions qualifying for inclusion in Italy’s GDP totalled €393.5bn. Besides breaking it down in different goods categories, it can tell us nothing more about the economic condition. The concept of growth is about the measure of money totals, not the goods and services freely demanded. With sound money and free markets, the evolving production of businesses increases the purchasing power of money over time. Technological innovation, improved production methods and competition will ensure this is the case. The inflationists claim this is a bad thing, incorrectly believing that a fall in the general level of prices (the flip side of sound money) is harmful to business, and therefore the economy. However, lower prices benefit the consumer, and in a properly functioning economy, the consumer is king, and business his servant, not the other way around as the statists would have it. Savings are vital for a properly functioning economy, because they fund enterprise. Wage earners are rarely paid in advance for their labour, and until their first pay-check they need to buy the necessities of life. At the same time, people who are already earning will arrange their lives so that there is a surplus from their production, which they can put aside as savings to spend later or in emergencies. These savings are the resources for change. John Maynard Keynes failed to grasp the importance of savings. He incorrectly took the view that an increase in savings leads to a decrease in potential aggregate demand, reducing gross output, and therefore reducing funds available for saving. He described his anticipation of an increase in saving leading to a subsequent decrease in saving as the paradox of thrift. This conclusion ignores the balance always achieved in free markets, whereby businesses bid up for savings to a level set by their expectation of the prices they might achieve for their production. Any borrowing beyond a certain point becomes an inefficient use of capital resources, and reduces the borrower’s return on capital employed. Keynes’s expectation, that there exists a savings paradox, is nonsense. The other side of savings is investment in production itself. Because GDP only captures products at final prices, it understates the contribution of this capital investment, which finances multiple production processes to produce the final capital good. The result is economists wrongly see money deployed in production as detracting from the potential for GDP growth. This is an important reason why they fail to appreciate the contribution of savings to economic progress. But then, they are not trying to measure progress. The balance between current and deferred consumption is set by the time-value between immediate and future consumption, in other words the amount of time that the saver parts with the use of his money. This is represented by a rate of interest agreed between lender and borrower, considering all the circumstances of the loan. It is entirely the business of borrowers and lenders, not the state. The state is incapable of setting an interest rate that maximises economic progress. It is clear from reading Keynes’s writings that he failed to understand the importance of savings, in the same way that he failed to grasp the impossibility of denying the truth behind Say’s law. This didn’t stop Keynes. He spent much of the 1930s working up a proposition that needed Say’s law to be ignored, culminating in his The General Theory of Employment, Interest and Money. He never succeeded, and had to resort to damning Say’s law as a tenet of classical economics, and therefore outdated. It is not a valid argument. His motive was to create a positive role for another actor, the state. By generating a budget deficit financed by monetary expansion, Keynes argued the state creates extra demand, raising aggregate demand to a greater level than that set by the confines of Say’s law. It amounts to a belief in perpetual economic motion through the absence of friction. Of course, its nuts: the friction is the unrecorded debasement of everyone’s money to pay for the extra demand. State-generated demand financed by inflation transfers demand from individual consumers to the state. That portion is now set by diktat, the whims of politicians and administrators, who are anti-progressive in their allocation of resources. Far from being perpetual motion, the reallocation of resources to the state from consumers introduces a friction that stifles progress. But that’s all right, because the greater quantity of money and credit increases GDP. The central bank targets GDP, so its mandate is satisfied. And what the state doesn’t spend on enhancing aggregate demand, it directs. Rather than compete, businesses find it easy and more congenial to lobby politicians and administrators for their support. The result is businesses made redundant by the market are fostered by the state, their survival being guaranteed by the continual expansion of money and bank credit. By tying up precious capital better deployed in production wanted by consumers, the overall economy is increasingly hampered. The problem is the state, not the private sector. Over time, the economy moves away from the condition where the customer is king and business is the servant, to business with the state’s backing telling the consumer what he he is allowed to buy. Debts to finance this reversal of roles accumulate, not least in the hands of the consumer who is encouraged to spend money he or she does not possess. GDP rises, so it’s mission achieved. Except that prices rise as well, which put alternatively, means the purchasing power of the money received by us as producers, buys less when we consume and our savings are debased. But we are told not to worry about that, because there’s more money coming out of thin air to pay for it. Until one day it doesn’t. Understanding the economy requires attention paid to how well an economy progresses, not to the money-totals represented by statistics such as GDP. GDP is little more than an accounting identity, but it has become the state’s measure of economic well-being. The consequence is debt-financed spending has progressively replaced genuine consumer demand. Despite all this, consumers in their wants and needs still drive progress, and when the immediate dangers from the risks to normal living introduced by statist interventions recede, the fact is that life goes on. We produce to consume, much to the surprise of the neo-classical economists fighting yesterday’s battles, and who have ditched Say’s law. If it is true that one person in a million fails to understand money, less than one in ten million understands the consequences of confusing GDP for economic progress. And that’s why despite all the monetary sickness in the Eurozone, the economy in many of the federation’s countries appears to be performing well. It is why the Atlanta Fed revising its forecasts for GDP downwards is irrelevant. And it is certainly why the Bank of England was so badly misled in its judgement of the economic consequences of Brexit. The Rarest Silver Eagle Bullion Coin Ever!